As promised, I have some exciting products to share with you from CSN Stores. Jess, the CSN Stores representative I worked with, offered me $60 to spend as I chose. Since it’s summer and I’m spending more and more time outdoors on the playground with my daughter, I thought I should look for some fun summer sandals for her feet. After hours of hard playing outdoors, her socks become glued to her feet with sweat. 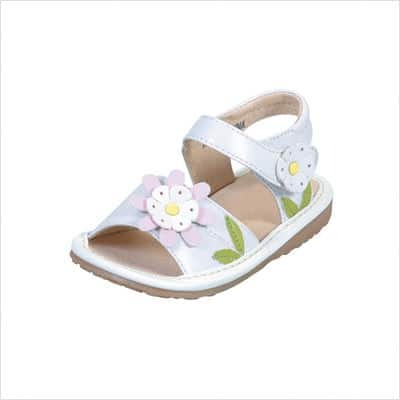 For $29.95, I received the Squeak Me Daisy Sandal in White. Like the Wee Squeak boots I told you about earlier this week, Zoe’s new sandals also have the removable squeaker. She’s had fun learning how to put the sandals on her own feet and fastening the velcro so we can go outside. Unfortunately the sandals came with a warning that the sandals should not be worn where sand or gravel could get inside the squeaker and keep it from squeaking, so she only gets to wear them away from the playground. Nevertheless, my daughter loves them and they can be paired with nearly every summer outfit she wears. I ordered them in a size 8 so she would have some room to grow, and won’t be surprised at all if they last her through next summer as well. I love to bake cookies, but all of my baking sheets are old and have tough grease stains and even burn marks that I’ve never been able to remove to my satisfaction. Luckily for me CSN Stores also has a collection of cookie sheets. 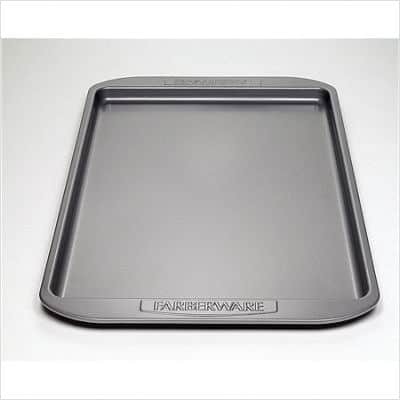 I chose the Farberware Nonstick Carbon Steel 11 x 17 cookie pan for $9.95. It’s sturdy, heats food evenly, and is easy to wipe clean. It’s recommended not to wash in the dishwasher, which was a bit of a disappointment to me because I love the convenience of a dishwasher. I was thankful that these helpful suggestions were included with the pan because I use this type of cookware several times a week and want to ensure that I keep getting the best performance from it. Before I had my daughter, I worked out at Gold’s Gym. I saw some results, but because they weren’t coming nearly as fast as I wanted, I didn’t put out the effort I probably should have. I always saw guys at the gym wearing some type of band around their waist, and wondered what it was. Then I saw that CSN Stores also has an exercise department. I still haven’t lost all the weight I gained from the pregnancy and am hopeful that the Cory Everson Waist Trimmer might help me get back to a more comfortable and eye-pleasing figure. I’ll be putting the waist trimmer to the ultimate test as I prepare for Stacie’s Fit for Fall event, coming in August. I was not financially compensated for this review. I received the products for free for the purpose of writing this post. This is my honest opinion. Great review! Thanks for sharing your opinions. I absolutely LOVE CSN Stores!